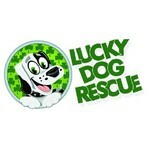 Lucky Dog Rescue, Inc hasn't added a story. October 6, 1940 - September 27, 2013, in honor of Gigi. Lucky Dog Rescue, Inc hasn't posted any updates yet. Lucky Dog Rescue, Inc is managing the funds for this campaign.